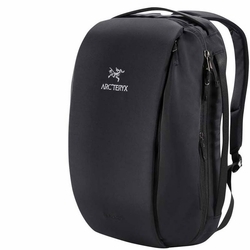 ARCTERYX Blade 20 Backpack. Minimalist styled pack created to carry daily tools for the digital world. Arc’teryx designs for use, conditions and environment. The Blade 20 is geared for both moving through the urban landscape and exploring the world. Its 20 L capacity holds a laptop, tablet, smaller electronics, travel documents, a jacket and lunch. Access and organization are key design components. The clamshell design opens wide for full exposure to the main compartment, and a side zip provides quick entry. Laptops up to 15 inches are protected in a dedicated padded compartment, and an additional sleeve secures a tablet. Built to move, the Blade 20 has a thermoformed padded back panel that adds comfort and load support. The shoulder straps have dual density cushioning for longwearing comfort and effective load dispersal. They tuck away cleanly and easily when using the Blade as a shoulder bag or stowing it for transport. With a streamlined profile not often found in a 20 L pack, the Blade easily handles bike commutes, subway rides and overhead compartments. Volume: 20 L / 1220 cu.in.